I don't think that I have ever prepared a study skin of a starling, but I deal with them on a daily basis. This summer a couple crammed themselves into a hole above our porch and bred (equals noise and mess!). When we first moved into our place, we constantly found them in the attic before we had the roof replaced and everything sealed. Two weeks ago, they upped the ante. Two of them had managed to get into the chimney and fell all the way down to the base of the stove pipe attached to the boiler in the basement. The wood burning stove had been running all day, so the boiler wasn't on (lucky for them). I could hear them scuffling about, and making sounds that seemed to be the bird equivalent of "you got me into this mess!". I opened the vent, then out they flew into the basement and right up into an opening in the ceiling. Gah! I managed to get them out the door after about 15 minutes of some antics with a broom, and the focused help of two cats. At one point while they were still tucked into the ceiling, I even tried talking "starling" to lure them out. I was surprised when one actually poked its head out, very interested, and then realized "oh crud, I've been duped!". Starlings are an introduced species. 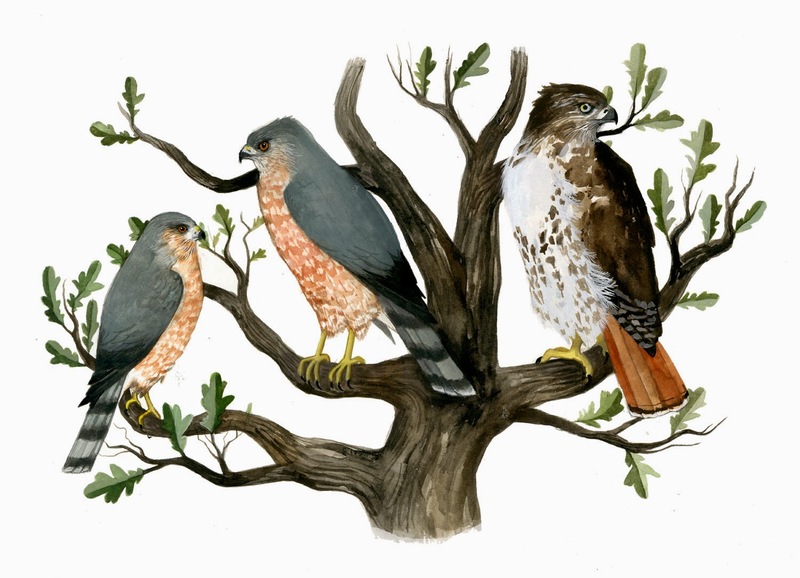 100 birds were released in Central Park in NYC in 1891, because of some group that wanted to release every species that appeared in a Shakespeare work. Since then they have spread across the continent and reached numbers of 200 million; all from 100 individuals. They're a highly social, gregarious species, and are also excellent mimics, mimicing anything from the songs of other birds, to human speech, to inanimate objects (i.e. cellphone rings). Their penchant for cavity nesting has had adverse effects on native species of birds, specifically woodpeckers. The more aggressive starlings will often evict woodpeckers from their cavity nests in trees. They're a familiar sight in rural areas in flocks of hundreds that ball up together and expand and contract across the field and sky. Gorgeous! I know I oughtn't like them, but I do. Partly because of their beautiful starry breasts, and partly because they're such a force to be reckoned with. I've got a weakness for ubiquitous pests. um...are the starlings for sale?? they're so very pretty. the painting sold. sorry! yes, i agree, there is a part of me that likes their tenacity and social nature even though i know they are wreaking havoc on some of our native birds. A few days ago the male red winged blackbirds showed up in force -- a sure sign spring is on the way. We had a dozen or more males in the backyard, and they're singing their heads off. Red-winged blackbirds tend to hang out with starlings. They mix in together perching on powerlines, and juvenile and female redwings can frequently be picked out amongst large groups of starlings (their coloring is slightly similar so they can be overlooked at a casual glance). Yesterday I watched a male redwing on our feeder tray perfectly content with two or three starlings by his side, but each time a blue jay approached the redwing chased the jay off. He wasn't even interested in the peanuts, which is what the jay was going after. This is a really, really great painting! I'm sad that it's already sold... for I would like to own it. Starlings are one of my most favorite birds of all. 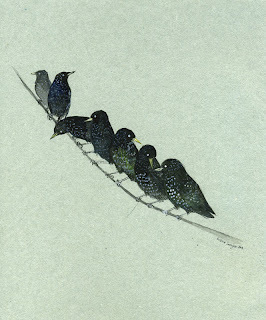 Please do you have any prints of this AWESOME study of starlings on a branch? I would love to have some of your work framed in my house!